1) Clean your living room. Undoubtedly it could use a good vacuum and dusting after all the Packers viewing parties you've been hosting in it for the past few weeks. 2) Go for a walk. It's still somewhat nice outside, so why not go for a lovely stroll in the neighborhood and look at all the beautiful leaves while they're still somewhat on the trees. 3) Catch up on sleep. I know you've been staying up late watching all of the Packers highlights over and over again, reading countless articles written by all of the sports analysts, and obsessing over your fantasy football stats, so you could probably use an extra hour or two of sleep. The Packers bye week is the time for that! 4) Go on that weekend getaway you've been meaning to take. Head out of town! Since the Packers are off, you don't need to rush home on Sunday or stress over finding the local Packer bar in strange lands. 5) Wash your Packers gear. It's been seven weeks. If you haven't washed your Aaron Rodgers jersey by now, it's seriously time. 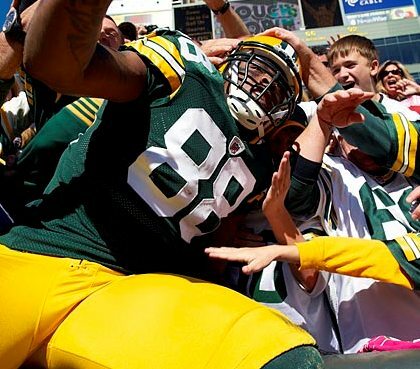 Thankfully the bye week only comes once a year and the Packers will be back in action before you know it!